This is such an easy recipe to make but it gives an amazing result. It utilises a “cheats” way to make fantastic coconut rum ice cream, just make sure you use a good quality but subtle vanilla ice cream (one that is white in colour). All the 3 sundae elements can be made a few hours in advance so it’s just a case of assembling them in a sundae glass before serving. If you dont have any sundea glasses then use wine glasses which look just as good. First to make the coconut rum ice cream take the ice cream out of the freezer for about half and hour so that it melts a little becoming more pliant. Make a few holes with a spoon in the ice cream (sticking the spoon in a moving back and forth) and pour in the coconut rum. Stir the rum in gently to the ice cream and then add the desiccated coconut and stir again until everything is well mixed. Put back into the freezer to harden and until your ready to use. Now the second part of the recipe is the rum pineapple. In a large pan on a medium heat melt the butter and add the tins of pineapple chunks along with the juice. Stir in the sugar, pinch of cinnemon and add the spiced rum and leave to simmer gently. After about 15-25 minutes the liquid should have reduced by half and turned a golden brown. Set aside and leave to cool. Finally for the rum cream, add the whipping cream to a large mixing bowl and whisk until it starts to become firm. Fold in a splash of the spiced rum and the icing sugar. Whisk until stiff peaks are formed. 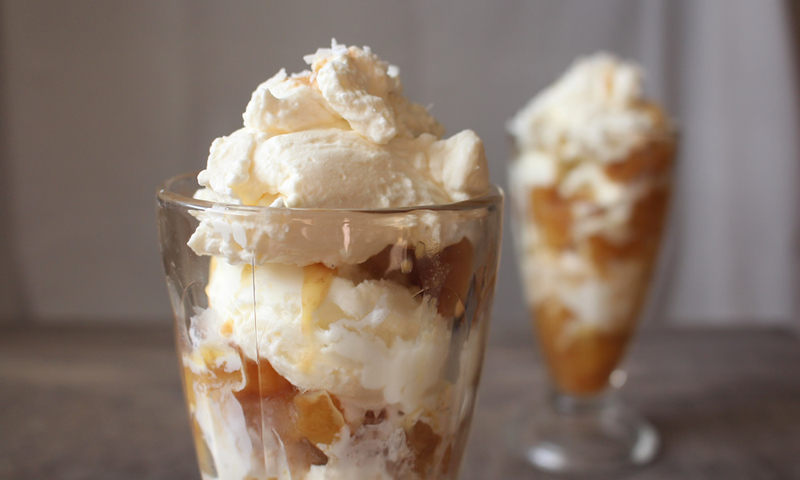 When you are ready to serve, layer your sundae or wine glasses with the pineapple and the coconut ice cream. Finish with the rum cream and a sprinkle of desiccated coconut.